Jeremy Dashon Kerley (born November 8, 1988) is an American football wide receiver and return specialist for the San Francisco 49ers of the National Football League (NFL). He was drafted by the New York Jets in the fifth round of the 2011 NFL Draft. He played college football at TCU. Kerley attended Hutto High School in Hutto, Texas, where he was a letterman in four sports, Kerley took his high school football team to the state finals in 2005 where he and his team faced Tatum and lost by a mere 3 points despite a great game performance by Kerley. His letterman included football and baseball. He played pitcher and centerfielder in baseball. At quarterback, Kerley led his football team to its first state championship game as a junior. Also a standout track athlete, Kerley was one of the state's top performers in the jumping events. He was a four-time state finalist in the triple jump. He qualified for the state track meet in the long jump (7.26 m) and triple jump (14.76 m), winning silver medals in both events. He was also a member of the 4 × 100 m and 4 × 400 m relay teams. 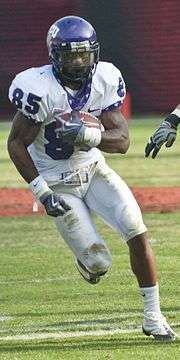 He was recruited by the University of Texas and Stanford University to play baseball, and by the University of Oklahoma to play football, but ultimately decided to play college football for Texas Christian University. Kerley was converted to wide receiver and return specialist at TCU after playing quarterback in high school. Following the 2009 season, Kerley was named Mountain West Conference Special Teams Player of the Year after breaking the conference record for punt return yards in a season with 563 yards. He had ten touchdown catches, one touchdown pass, and two rushing touchdowns in 2010. He ranked second in the nation in punt returns and third in the nation in kickoff returns. He was named the Mountain West Conference Special Teams Player of the Year for the second consecutive year in 2010, as well as second-team All-Mountain West honors at wide receiver. Kerley was one of three finalists in 2010 for the Paul Hornung Award, which honors the most versatile college football player in the nation. Kerley was projected to be drafted in the fifth round of the 2011 NFL Draft. Shuttle and 3-cone values from Pro Day workout on March 11, all other values from 2011 NFL Scouting Combine. Kerley was selected with the 153rd pick in the fifth round of the 2011 NFL Draft by the New York Jets. He caught his first career touchdown pass from Mark Sanchez against the New England Patriots on October 9, 2011. During the home opener against the Buffalo Bills on September 9, 2012, Kerley got his first career punt return touchdown. After Tim Tebow requested to be removed from the wildcat formation, Kerley took his place, and threw a 42-yard pass, though the Jets lost to the San Diego Chargers 17-27. On October 21, 2014, Kerley agreed to a 4-year, $16 million contract extension with $5.4 million guaranteed. Kerley ended the 2015 season in career-highs in punt returns (48) and punt return yards (411). On March 9, 2016, Kerley was released. On March 21, 2016, Kerley signed a one-year deal with the Detroit Lions. On August 29, 2016, the Lions traded Kerley to the San Francisco 49ers in exchange for guard Brandon Thomas. Kerley's parents are Charlotte and Donald Kerley and Kerley has a son, Dae'shon. Kerley is married to Kristal Juarez. 1 2 3 4 5 Bennett, Brian (December 30, 2010), TCU's Jeremy Kerley can do it all, ESPN, archived from the original on May 1, 2011, retrieved April 16, 2011 . ↑ Watson, Graham (January 3, 2010). "TCU's Kerley is thinking about baseball". ESPN.com. Retrieved 2011-04-16. 1 2 Adelson, Andrea (November 2, 2010). "TCU, Utah feature top special teams". ESPN.com. Retrieved 2011-04-16. ↑ Watson, Graham (December 1, 2009). "TCU dominates all-MWC team". ESPN.com. Retrieved 2011-04-16. ↑ Adelson, Andrea (March 4, 2011). "Non-AQ Top 25 Players: No. 12". ESPN.com. Retrieved 2011-04-16. ↑ Adelson, Andrea (November 30, 2010). "Andy Dalton headlines MWC awards". ESPN.com. Retrieved 2011-04-16. 1 2 Jeremy Kerley, NFL Draft Scout, archived from the original on May 1, 2011, retrieved April 16, 2011 . ↑ Lange, Randy (April 30, 2011). "Jets Trade Up in Round 5, Take WR Kerley". New York Jets. Archived from the original on May 1, 2011. Retrieved May 1, 2011. ↑ Hanzus, Dan (2012-12-23). "Tim Tebow reportedly asks out of Jets' Wildcat". National Football League. Retrieved 2012-12-23. 1 2 "Lions sign free agent WR Jeremy Kerley". www.detroitlions.com. Retrieved 2016-03-21. ↑ Patra, Kevin (August 28, 2016). "Lions trade wideout Jeremy Kerley to 49ers". NFL.com. Retrieved August 28, 2016. ↑ "Jeremy Kerley Stats". ESPN Internet Ventures. Retrieved 7 February 2014.